Many cities are finding that something as simple as installing a split rail fence around a cleared and mowed vacant lot not only fights urban blight, it can help fight crime. Inspired by a program in Philadelphia, cities such as Cincinnati, Houston and New Orleans are using heavy equipment to clear, grade and seed thousands of vacant lots, believing that empty properties with head-high weeds, scrubby trees, trash and debris are excellent hiding places for guns, drugs and criminal activity. After the initial cleanup, cities partner with neighborhood groups and nonprofits to care for the lots, or in some instances sell them to people who agree to maintain or develop them. Installing a fence around a vacant lot can make a huge difference by signaling that although a lot is vacant, it isn’t abandoned. The theory, akin to the “broken windows” philosophy of policing, is that minor crimes, such as littering and vandalism, are signs of social disorder that often invite more serious crime. “Without it, it’s as if the property has no ownership and it’s open to any sort of activity,” said Debora Flora, executive director of the Mahoning County Land Bank in Youngstown, Ohio, where 23,000 parcels of land are vacant. 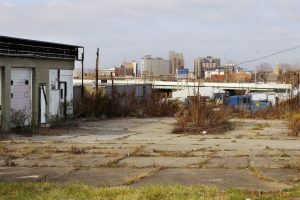 The cleanup effort has been spurred by an explosion of vacant property, especially in Rust Belt cities like Youngstown, Baltimore, Chicago, Cleveland and Detroit, where populations have declined or the 2008 foreclosure crisis swelled the number of vacancies. Detroit has more than 6,000 vacant lots it offers for urban agriculture or as solutions to urban runoff. Chicago has nearly 13,500 lots that are city-owned and is selling them for $1. In New Orleans, the widespread devastation caused by Hurricane Katrina in 2005 made the cleanup of vacant property a huge, ongoing undertaking. There, the city has a program called Lot Maintenance Plus, part of its NOLA For Life murder reduction strategy. Lot cleanups not only remove potential crime locations, they provide employment to at-risk youth. In Philadelphia — where the LandCare program maintains 12,000 lots, or more than a quarter of the city’s vacant lots that have been graded, seeded and fenced since 2004 — cleaning up and caring for empty property has proven to decrease crime and save the public money. A 2016 study by the University of Pennsylvania’s Urban Health Lab showed that fixing up vacant lots reduced nearby gun violence by 5 percent, and putting functioning windows and doors in abandoned houses, instead of boarding them up, cut nearby gun violence by 39 percent. The study also found that every dollar Philadelphia spends on fixing up vacant lots saves taxpayers $26 in reduced costs from gun violence. Clearing vacant lots may have other positive effects. Research indicates that adding green space to crowded urban settings improves mental and physical health. And cities realize vacant property can be a lingering problem if not dealt with because in many areas real estate markets will not rebound any time soon. Philadelphia’s LandCare program is considered a model. The city runs the $2.9 million program through the Pennsylvania Horticultural Society, which in turn hires contractors or neighborhood groups to maintain the lots. It found that some fences make for better neighbors and better results than others. When LandCare launched, it put chain link fences around the cleared lots. But it soon discovered that the barriers kept neighbors from using the land for anything other than a place to toss trash. By switching to split rail fences, the space could be used by kids to play near their homes. That led residents to start asking for other lots to be remediated. The city of Houston modeled its vacant lot maintenance program on Philadelphia’s. Mow Down began as a pilot program in 2013 and now covers 261 lots with the goal of doubling that number annually, said Reggie Harris, deputy assistant director of Houston’s Department of Neighborhoods. Houston contracts with the nonprofit Keep Houston Beautiful, which in turn works with neighborhood groups who mow vacant lots for $50 a cut. The local groups don’t have to go through the red tape of qualifying as city contractors and the city — which would have to pay a contractor at least $300 for the same service — saves money. Cincinnati last year stepped up its Private Lot Abatement Program, clearing more than 1,200 properties in the most recent fiscal year that ended July 1. City manager Harry Black said the city also raised fines for overgrown grass and building code violations and began using its power to take over problem properties through a “chronic nuisance” ordinance, backed by data collection and analysis. And in February, the city launched a police initiative that focuses not just on arrests. It focuses also on removing blight in violence-plagued locations as a way to prevent crime from recurring, said Cincinnati Police Lt. Matt Hammer, who leads the initiative. In the city’s East Westwood neighborhood, at an intersection where shootings were frequent, a wildly overgrown lot concealed a back stairway to a vacant house, making a “comfort space” for a thriving drug market, Hammer said. Police found guns hidden in the tall grass. Arresting the drug traffickers was one step, Hammer said, but the second was to clear the vacant lot so a new dealer wouldn’t set up shop in the same place and to force the property owner to bring the vacant house up to code. Since the lot has been cleared, shootings in the area have fallen from 14 in 2015 to five in 2016. A trash-strewn lot is the archetype of the broken windows philosophy: a small amount of disorder that leads to bigger problems. But since the broken windows approach has become associated in many cities with aggressive policing of minor crimes that disproportionately affects minorities, some city officials who are tackling blight to prevent crime don’t call it that. Cincinnati has begun using its data analysis capabilities not only to identify blighted target areas, but to predict what properties may soon become blighted, creating an algorithm that includes building and health inspections, citations, police calls and property values. “We’re not descending on that area like an invading army and writing up everybody that’s got a blade of grass an inch over” the limit, said Mark Manning, the city attorney who heads enforcement of the city’s chronic nuisance ordinance, under which Cincinnati can require a property owner who gets too many citations to come up with a remediation plan or lose ownership. Charles Branas, the University of Pennsylvania epidemiologist who studied vacant lot cleanup and violence, said fixing blighted property is an uncontroversial route to fighting crime at a time when gun control legislation, for instance, is difficult to enact and police tactics such as stop-and-frisk have been harshly criticized. Saving public money can help sell cleanup programs, Philadelphia’s Green said. “Having a number like ‘For every dollar you invest $26 comes back to taxpayers’ is a lot clearer for people,” he said. Taxpayers do front the money: vacant land improvement programs use public money to clean up not just city-owned lots, but private property that bad owners have neglected. And that can be “a really tough call,” said Mallach of the Center for Community Progress. To recoup costs, Philadelphia bills property owners for the cost of the cleanup. In Houston, the Mow Down program files a lien on the property to cover the cost of maintaining it. Those involved with vacant lot cleanup say the expectation is low of collecting reimbursement on a vacant property without much resale value. “It’s really hard to collect on these bills, regardless,” says Amber Knee of the LandCare program.